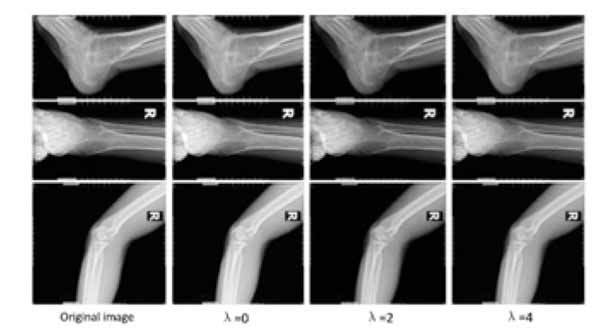 This paper focuses on studying an improved DR (Digital Radiography) technique in which the nonlinear transfer function and the adaptive unsharp masking method are coupled together. By introducing a product factor λ, this technique effectively wipes off the image noise and disturbance, while the interesting areas and borders in image are highlighted either. Besides, the whole enhancing process is automatic without loss in scalability. The experiment results show that this technique works well in most instances. Digital radiography (DR), medical image enhancement, nonlinear transfer function, scalability, unsharp masking. College of Computer and Communication, Hunan University of Technology, P.O. Box: 412007, Zhuzhou, China.